All who gaze upon its richly layered beauty are compelled to ascribe the Celtic knot meaning and purpose. For many, this Celtic symbol represents eternity ... the eternity of life, the eternity of nature, and the eternity of love. These designs are not only exquisite and beautiful.... They also compel the beholder to ascribe the Celtic knot meaning, even though these meanings may or may not have any historical basis in fact. So many people ask, "What is the Celtic knot symbol for love?"... or, "I'm looking for a Celtic knot meaning strength..." or, "Where can I find a Celtic knotwork tattoo design meaning brotherhood?" Perhaps the answer to these questions is disappointing. Nevertheless, the honest answer is that Celtic symbolism is not that concrete. For one thing, there are no written records of what the various knots symbolized at the time they were originally created. Their meanings are really in the eyes of the artists and of the beholder. And they are much more abstract than symbolizing specific human emotions or relationships. 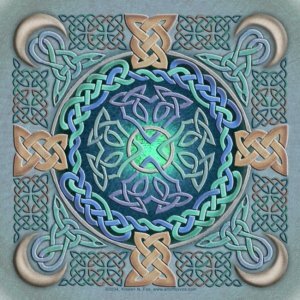 As with most Celtic symbols, the meaning of various knotwork designs are more abstract and are usually more related to the universe and life in general. Most modern Celtic artists say that the meaning of knotwork lies in the complex interlacing patterns. By combining the knots into long, continuous strands, the woven structure is formed from one or many individual loops. These endless strands are like the ties that bond us all together. As each generation passes, the weave grows larger. And as the weave grows larger, it grows more complex and brings itself back in on itself, such that the next generation will continue on to bring forth the generation after that. Celtic knots are not designed to be merely pleasing to the eyes. They are also symbols that can show us how we are all part of a neverending cycle of life, where we each add our particular strand in the fabric of time and space. 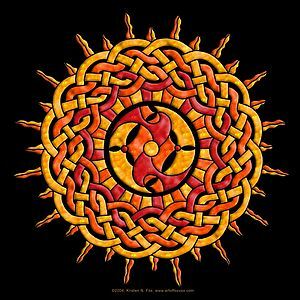 And just as the lines of Celtic knots are interwoven, so are we interwoven with all those around us. We continue on to eternity as others continue on to eternity, inexorably wrapped up with all those who join us in this life and the next. Though each loop is individual, each loop cannot be separated from the whole. Athough they are sublimely complex at first viewing, they are simple to understand in their details. One weave is simple. A page of them is confounding. Yet, as we can understand others by understanding our own connections to them, we can understand the whole by understanding each connection. From these, the great artwork of life itself is formed. Individual loops and strands all combining into a rich tapestry of wonderment and beauty.